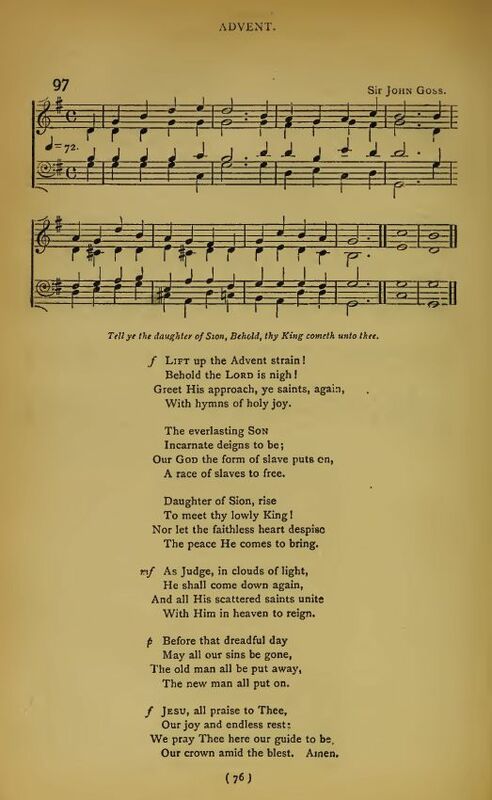 The Hymnary (London, 1872), #97, p. 76. Lift up the Advent strain! Behold the Lord is nigh! Greet His approach, ye saints, again. With hymns of holy joy. A race of slaves to free. To meet thy lowly King ! The peace He comes to bring. With Him in heaven to reign. The new man all put on. We pray Thee here our guide to be. Our crown amid the blest. Amen. Sheet Music from The Hymnary (London, 1872), #97, p. 76.